Adult cancers tend to be a little different from childhood cancers, and trying to explain the disease to a young person adds to the separation. Dr. Donald Small, director of pediatric oncology at the Johns Hopkins Kimmel Cancer Center, said cancer in children is rare, and most are treatable. 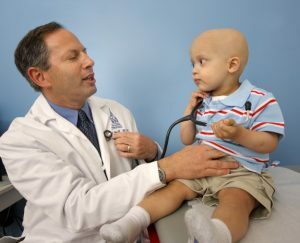 But trying to explain a cancer diagnosis to a child can be daunting. In a podcast for Vermont Public Radio, Small gives some examples on how cancer can be described, why some people get sick while others don't, and how cells start growing out of control.